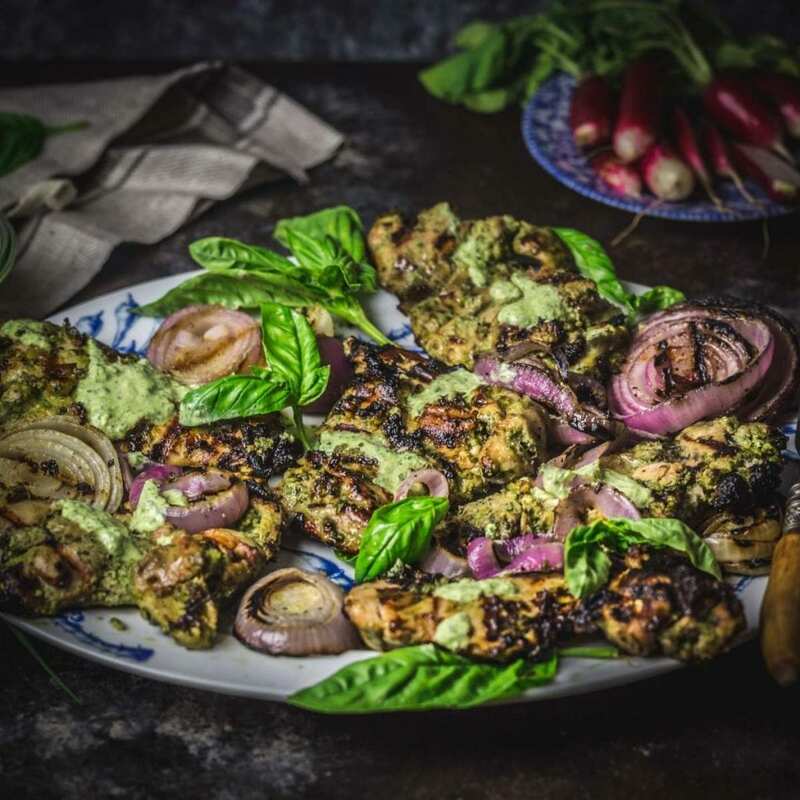 Give chicken thighs or breasts a long marinade in Green Goddess dressing, and char them to perfection on the grill along with sweet red onions. Then dollop more herby dressing on them for good measure and eat dinner under the stars. Well, it was inevitable. Last week, after complaining that the summer had been so cold after a spring that was so cold and a winter that was so very cold, we finally got hit with the annual New York heatwave. And to the friends and family members who always say “OMG I love this heat! I could take it all year round!”, I literally do not know who you are and please get off me with your sweaty hug. While we were merrily cavorting around the garden a few days ago, tending to the herbs, the tomato plants and the budding zucchinis, now we’re staring sadly through the window from the air-conditioned interior. It may look pretty out there, but just half an hour in the sun and we both tend to go all Mad Max Fury Road. And nobody wants that. So if we can’t go to the herbs, the herbs must come to us. And that’s best achieved in the form of Green Goddess dressing. If you’re not familiar with it, it’s basically a fancied up ranch, loaded up with Greek yogurt, a little mayonnaise, garlic and all the soft herbs in the garden. We like to make efficient use of our grill over the summer. 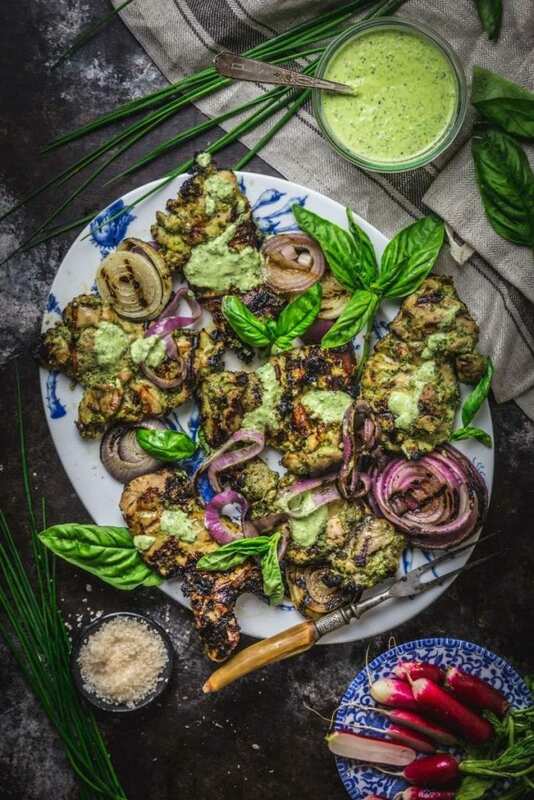 The crowd-pleasing standards, like burgers or grilled veggies, are straightforward enough, but when we remember how incredibly easy it is to throw together a marinade full of seasonal green deliciousness, to kick up grilled chicken for example, anything less feels rather lazy. 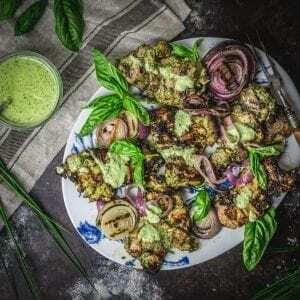 The recipe for the Green Goddess marinade/dressing is pretty much the same as our version from a couple of years back, which we used to great success in the Ultimate Fried Chicken Sandwich. It’s pretty flexible and you can add more or less of whatever soft-leaved herbs you have available. We like to use loads of basil and chives, but parsley, tarragon, chervil and mint are also fantastic. Don’t skimp on the anchovies, though: even though you won’t taste them, they add a crucial savory backbone to the dressing. If you’re on the fence about anchovies, and think they will make your recipe fishy: trust us, they won’t. We happened to have green garlic in our garden, so we used that in place of the regular kind, lending the dish a mild allium flavor without too much bite. You can use either boneless chicken breasts or thighs in this recipe. If you get breasts, and they’re on the thick side, we recommend that you cut them in half to make two thinner cutlets and pound them a little before the marinating stage. Lay sheets of plastic wrap below and on top of each piece of chicken, and use a rolling pin, a heavy pot or the flat side of a tenderizer mallet to pound them out. This will help the flavor permeate the meat, and also make sure that you’re able to evenly grill the chicken without the edges getting dry. As usual, there’s no need to wash store-bought chicken – just transfer them to a large sealable plastic bag, and pour in about a cup of the marinade (if the marinade is very thick, stir in a tablespoon or two of water until you can drizzle it). Reserve the rest of the dressing and store it separately in the fridge – we’ll use this to dollop onto the cooked chicken and onions later. Use your hands around the bag to thoroughly coat the chicken (boneless thighs tend to be folded up, so make sure you get the insides coated too) and store it in the fridge for at least 30 minutes, and preferably overnight for best results. 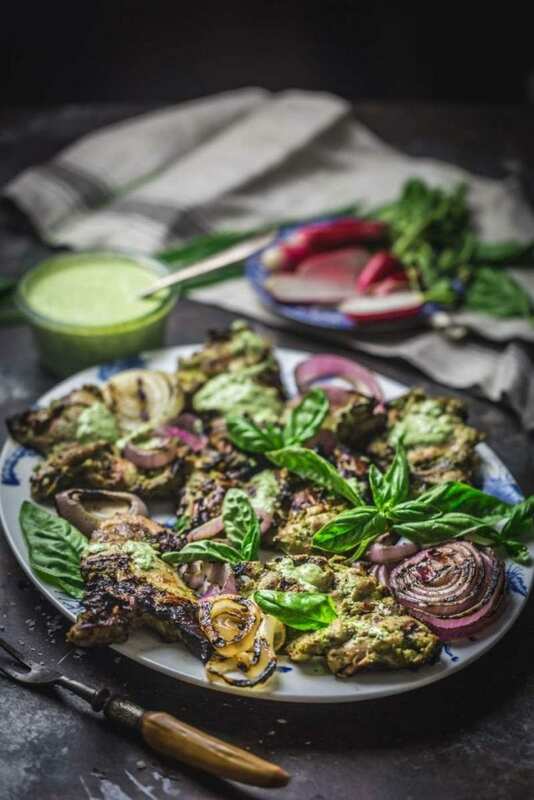 When you’re ready to cook, pre-heat your grill, brush the grates and oil them by dipping a wad of paper towel in neutral oil (eg canola) and using tongs to rub it over the grill surface. Slice up your onions (we happened to have both a red and a sweet Vidalia onion, which worked together very well, but use whatever larger onions you have). Don’t slice them too thin – about half an inch should do it – and try to keep the rings together so they don’t fall into your fire. Brush the slices with a little olive oil both sides, and sprinkle with some salt and pepper. When the grill reaches temperature, remove the chicken pieces from the bag, shake off any loose marinade, and lay them carefully on the grate. Discard the bag of marinade. We timed our pieces at 4-5 minutes for the first side, flip, and continue to cook the other side for a couple of minutes more. You could use a stick thermometer (look for 165°F) to be precise, but honestly, if you’re cooking thin pieces of chicken on a really hot grill, you should be good with that timing. The onions should take about the same length of time, so you can put them on with the chicken. Note: you can also cook this on a stove-top grill pan or even bake them in the oven. If baking, place the chicken and onions on a sheet pan and cook in a pre-heated 375ºF oven until chicken is cooked through, about 25 minutes or so. You can broil them if you want a little dark brown char. When the chicken is cooked, let it rest for at least 5 minutes before cutting. Dollop some of the reserved dressing (not from the marinade bag!) over the grilled chicken and onion slices. We served ours with sautéed corn cut off the cob and fresh sliced radishes. Post script! We’re traveling to the UK for the rest of the month (Matt’s Mum is getting married, and we’ll also be taking notes on some of the restaurants and food we encounter), so there won’t be any new recipes in July – instead we’ll re-post some of our favorite summer articles over the next few weeks. Have a great July! — Wear sunscreen! — Hydrate! — and we’ll be back in August when I’m sure we’ll be wrestling with monster zucchini. Add garlic clove (or chopped green garlic), scallions, and herbs to the bowl of a food processor or blender. Pulse about 10 to 12 times, until herbs are finely minced. Add anchovies, yogurt, mayonnaise, lemon juice and zest and process until smooth, about 1 minute, scraping down bowl as needed. Taste for seasoning and add salt and pepper to taste. If dressing is too thick, add a couple of tablespoons water. You should be able to drizzle it off a spoon. Set aside. Note: dressing can be made up to 3 days ahead. Cut chicken breasts in half lengthwise, making two thinner cutlets. Place each cutlet between 2 pieces of plastic wrap and pound until even and about ¼-inch thick. Add pounded chicken to a sealable plastic bag and pour about a cup of the marinade into bag. Move the chicken around, making sure every piece is coated, then seal the bag and refrigerate for at least 2 hours, and up to 24 hours. Transfer the rest of the dressing to a sealable jar and refrigerate. Prepare a grill for high heat and take the chicken out of the refrigerator. Brush onions with olive oil and season with salt and pepper. When grill is hot, clean and oil grill grates. Grill chicken and onions until cooked through and brown in spots, about 4 to 5 minutes each side, depending on how hot your grill gets. Transfer chicken and onions to a clean platter and drizzle some of the reserved dressing over. Serve warm or room temperature.